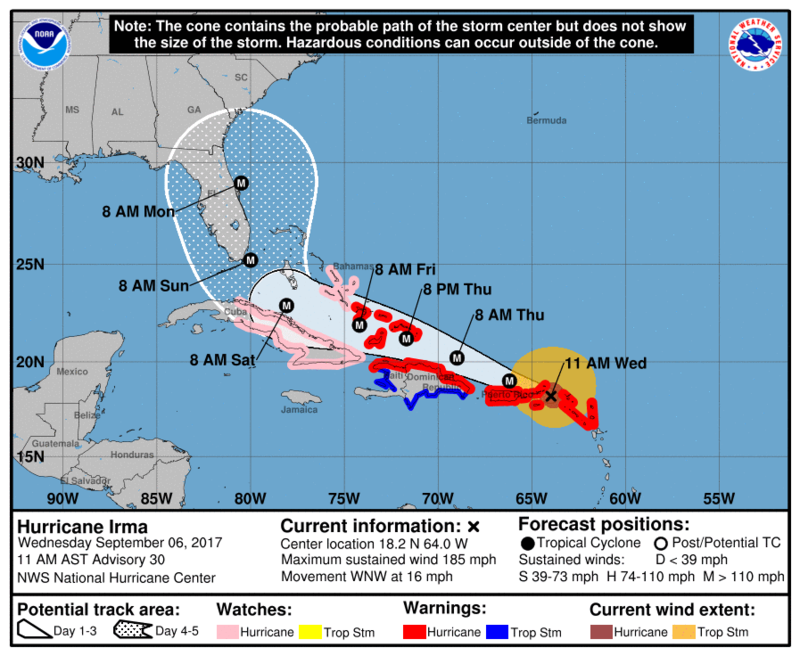 Category 5 Hurricane Irma, one of the most powerful Atlantic Ocean storms ever recorded, is moving across the Caribbean with sustained winds up to 185 miles per hour. I am writing to ask for your prayers for Haiti’s neighboring countries in the path of the storm, as well as our brothers and sisters in the northern part of Haiti where this dangerous storm is projected to make landfall tomorrow. A Hurricane Watch is in effect for the northern coastline of Haiti and a Tropical Storm Watch is in effect for the western coast of Haiti to the capital city of Port-au-Prince, where Heartline is located. Please pray for protection of Heartline families and friends who live in the northern part of Haiti, and for churches and organizations working hard to prepare the most vulnerable Haitians for the storm. We don’t yet know how the storm will impact Haiti, but do know that Category 5 storms cause catastrophic damage when they make landfall. For countries like Haiti that have weak infrastructure and emergency response capabilities, even tropical storms, much less Category 5 hurricanes, can cause widespread destruction. Haitians most acutely affected by the storm will need assistance. We are in communication with partner organizations and will be back in touch once we have a clearer understanding of the emergency needs. Please pray for safety, protection, and relief assistance for victims in other Caribbean nations already affected by the storm. Pray for protection of life in Haiti. Pray for displaced people severely affected by Hurricane Harvey in Texas. Click here to join Heartline’s Prayer Team. We will post ongoing updates to our Facebook, Twitter, and Instagram pages. Please follow us there to stay connected. In times like these, all of us at Heartline are deeply grateful to know that you care. Thank you for standing in solidarity with God’s beloved children and families in Haiti. Praying now for God’s mercy and protection. Praying, praying, PRAYING! Sending you all much love. God is good all the time. Have been praying and will continue!